We’ve been in Papeete for a week now and most of our chores are done. Does it seem like all we do is sail and work on the boat? Well, not entirely. 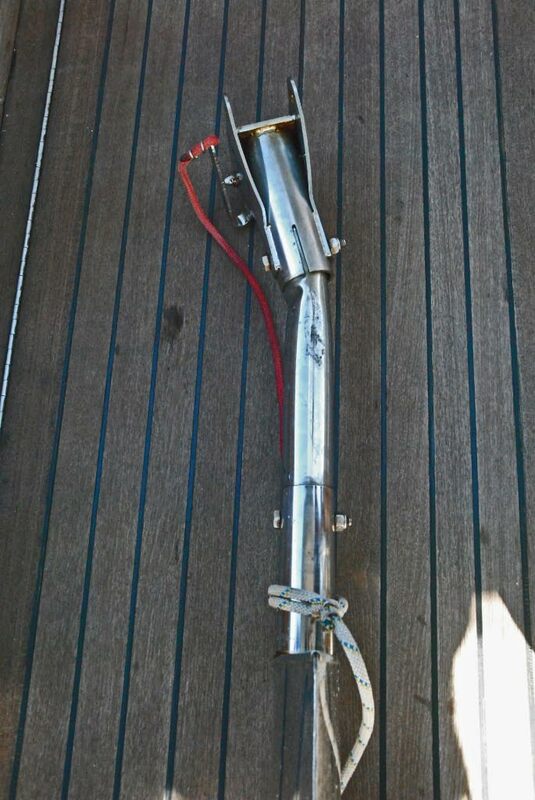 The windvane took a hit from a big beam on wave on an overnight passage in the Tuamotus and bent. Luckily it bent where it was supposed to, on a tube that’s designed to collapse, saving the other parts of the windvane. So we needed to replace the “collision tube”, which is a 16″ piece of stainless steel tubing that has a lighter wall thickness than the rest of the unit. Sounds like it should be fairly easy, but not so. Rob schlepped around our bent up piece of tubing to every chandlery in Papeete. Finally, when he was almost to the last possible store he was asking at the counter and a Frenchman in line behind him said “I think I have some of that at my boatyard”. Turns out the guy owned a local ferry and had a boatyard where he took Rob. He told his guys to dig in the scrap bin, and sure enough they pulled out a piece that was long enough to cut off two spares for us! He wouldn’t take any money for it, saving us what was about to become an emergency shipment from the states if Rob had completely struck out. The autopilot also barfed on the way in here, giving us a “drive until failure” message. Rob dug down to the back of the boat where it hooks up to the rudder post and one of the bolts had sheared off, leaving the unit basically hanging in mid air. You definitely could call it a drive unit failure when it’s not even hooked up to the drive unit. Some drilling, pounding, grinding and a little hard work later and the autopilot is behaving again. Our wind generator also died on the way in here, and that one’s still a mystery. Rob’s written to the manufacturer after checking all the connections and technical electrical stuff, but no answer back yet. And having been a marine electrician in a previous life, Rob definitely understands the electrical things, so hopefully we’ll get some help from the folks who built it. The biggest project here was to get Maya’s blood tested for rabies, in order to get bio-clearance into New Zealand. We need a blood test that’s more than 6 months old and less than a year old when we arrive in New Zealand. We couldn’t get it done in Central America, but knew we could here, reading from cruiser’s adventures in years past. There is a guy in the anchorage who needed to ask Rob some questions about his watermaker, and during the course of the conversation we found out he had dealt with the same issue to get clearance for his dog here in Papeete. And the good news was there was a French vet who spoke good English on a cruising boat about 200 yards away, who is working with a local clinic. The vet came to our boat the next day and I held Maya tight while he drew a big vial of blood from her right arm (she was such a good kitten). That vial will get shipped to the lab in Australia (one of apparently 3 places in the western world who does this test) on Monday when the vet brings back the sample. That’s been one of our biggest worries for the longest time, thinking we had to deal with a French lab in Paris and the potential language difficulties. Finding an Aussie lab is just the best news ever. So after we get the blood to Federal Express on Monday we can finish up the last of our provisioning and head north to the rest of the Societies. We really need to get heading toward the Cooks where we can afford to fill up the boat with food again. I know I promised not to whine about the prices anymore, but this is just so crazy. I was at the store looking for fresh chicken and I’m sure I totally gasped out loud when I saw the package of 8 chicken legs for $25.00. Luckily we found the frozen chicken section and can afford to eat a little bit of chicken between here and Rarotonga. I’m just hoping Rob’s fishing gear does well for the rest of the month as we sail between the Society Islands. Last night we went with friends to the evening’s performance of the Heiva Festival. 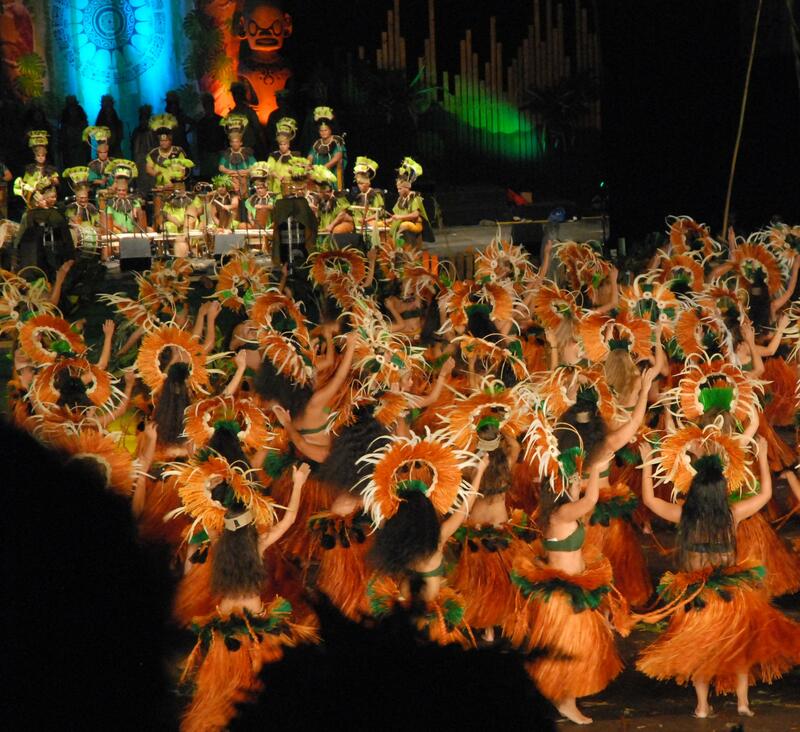 It’s an annual dance and song competition, with dance troupes and singing groups performing every night for 8 days, and awards given at the end of the week. All the program info is in French, but what I figured out was that there are two types of dance groups, Heiva and Heiva Nui. The first group we saw has only been performing together for three years and has 100 dancers. They were pretty good. The second group we saw has been together since 1993 and has 160 dancers, and they were awesome. The drums and instruments were mesmerizing, the costumes beautiful, and the dancers and choreography amazing. The only bad part was that no cameras were allowed, so we didn’t get to record any of it. OK, well maybe Rob snuck in a few pictures, but the ushers were constantly scanning the crowd and stopping people who got caught. Each dance troupe performed for an hour, which included multiple costume changes, solo dances, and lots of great traditional music. This is not an event for the tourists, it’s for the locals and they were all out and dressed for a special night on the town. I felt lucky to get to be a part of it. Today we’re going to scuba dive on a wreck inside the lagoon here in Tahiti with some friends. It’s in about 30′ of water on the outer reef. We haven’t been in the water here yet, but it’s so amazingly clear and we’re looking forward to checking out the wreck. Unfortunately the water temp is only 77 degrees, so we’re glad it’s a relatively shallow dive.